Unlike some of its peers, this human capital management software provider’s margins are expanding rapidly. 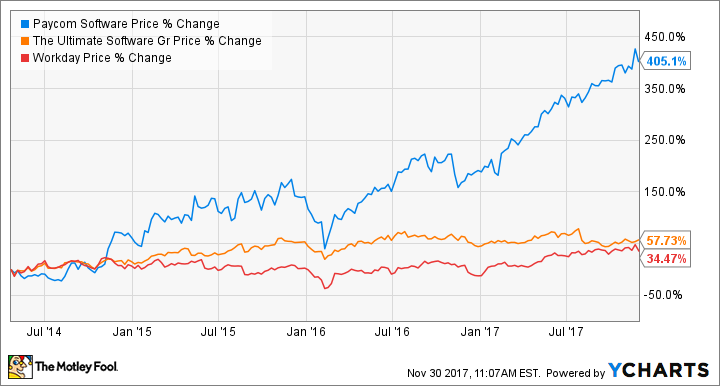 Paycom Software's (NYSE:PAYC) revenue growth over the past several years has been dramatic -- increasing by 40% or more annually from 2013 to 2016. The company's ability to manage costs and increase its margins over the same time period have been equally impressive. The company's preferred margin metric is adjusted EBITDA margin, a measure of operating profitability as a percentage of revenue. Paycom's adjusted EBITDA margin has steadily increased from 16.7% in 2012 to 28.7% in 2016. And it looks like this number will continue to rise. The company's latest guidance implies an adjusted EBITDA margin of around 31% for 2017. Let's examine Paycom's incredible expanding margins in the context of a couple of its peers. Paycom sells cloud-based payroll and human capital management (HCM) software that employers use for everything from payroll and performance reviews to hiring and governmental compliance. It's a crowded industry with established legacy players like ADP and Paychex, as well as newer entrants like Paycom, Workday (NASDAQ:WDAY), and Ultimate Software Group (NASDAQ:ULTI). These latter three companies don't necessarily compete for the same customers. Paycom is focused on smaller companies in the 50- to 2,000-employee range. Workday counts roughly 30% of the Fortune 500 as clients. And Ultimate seems to play mostly in between those extremes. But they all offer cloud-based solutions that essentially perform similar functions. And they're all scaling up as quickly as possible. But all growth is not created equal. Though each of these companies is prioritizing top-line expansion, over the past three years, Paycom's revenue growth has significantly outpaced growth in its "big 3" variable operating expenses. Even though the company has had to make significant investments in R&D, its salesforce, and administrative operations to fund its growth, it's been able to keep these expenses (as a group) at a level that improves its bottom line. *Workday's fiscal year ends Jan. 31 rather than Dec. 31. Data source: Company financials. Growth rate calculations by author. By the same measures, Ultimate Software Group's expenses are heading the wrong way relative to its revenue growth. For Workday, its revenue growth came in ahead of its growth in expenses, but not by much. You can see the effect of revenue vs. expenses over time even more clearly in these companies' operating margins. *Workday's fiscal year ends Jan. 31 rather than Dec. 31. Data source: Company financials. Calculations by author. From 2014 to 2016, Paycom's operating margin rose by 7.5 percentage points, more than double the margin improvement seen by Workday (which isn't yet profitable). Ultimate's margin nearly got cut in half over the same period. With the highest margins in the group by far, Paycom is also improving its margins more quickly than the others as well. This year, things have continued to play out largely the same for Paycom. In the most recent quarter, revenue increased by 31% year-over-year, while G&A, R&D, and sales and marketing expenses (combined) increased just 16% year-over-year. Don't misunderstand -- Paycom is still investing heavily in R&D, marketing and its sales team in the pursuit of top-line growth. In fact, CEO Chad Richison has said R&D costs are likely to keep growing at 80% to 100% annually. But despite this, Paycom has set a long-term adjusted EBITDA margin target of 30% to 33%, implying future upside beyond what the company is likely to achieve this year. The simplest reason for that is the company says its beginning to benefit from economies of scale that has helped moderate certain sales and marketing expenses. To me, Paycom looks like the superior operator in the HCM industry. The company's rapidly rising revenues, combined with expanding margins, should provide plenty of future earnings growth as well. I expect Paycom to keep outperforming the broader market -- and its peers -- in the years ahead.